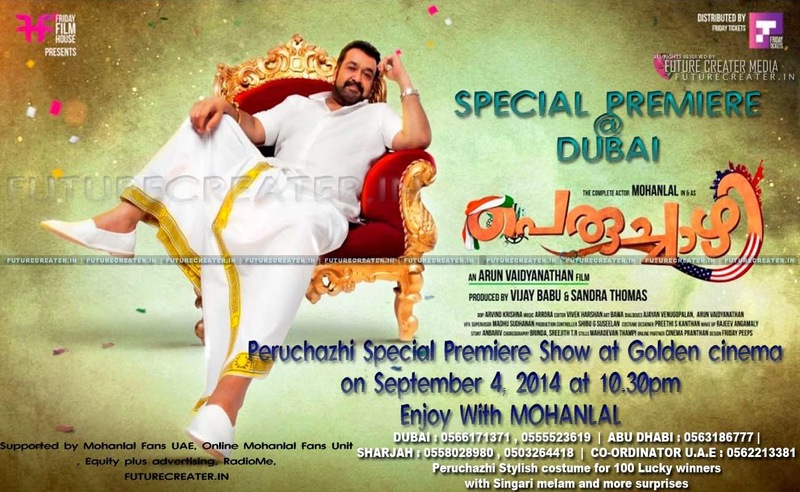 After the great success in Kerala & USA Mohanlal's movie 'Perichazhi', will be released in the middle east region on September 4, 2014 after the premiere show which is expected to be attended by the star himself. Equity plus advertising -The agency promoting the movie over middle east, RadioMe and Mohanlal fans online units have joined hands to organize the special premiere at Golden cinema on Thursday September 4, 2014 at 10.30pm at Dubai. Being an Onam release, a special activity has been organized in which Peruchazhi dhothi style costume for 100 lucky winners. Sinkari Melam to welcome the new movie on premiere show.